Premium quality Organic seeds grown in Western Canada. Nutritionally similar to brown flax seeds, yet it has a slight nutty flavour. Non-hydrogenated and trans-fat free. Sprinkling over salads, baked goods, meals, yogourt, and cereals. Add to smoothies, cereals, or yogourt. Consume within 6 to 8 weeks: Please squeeze air out of package and refrigerate after opening. Certified Organic by Pro-Cert. Manufactured in Canada. 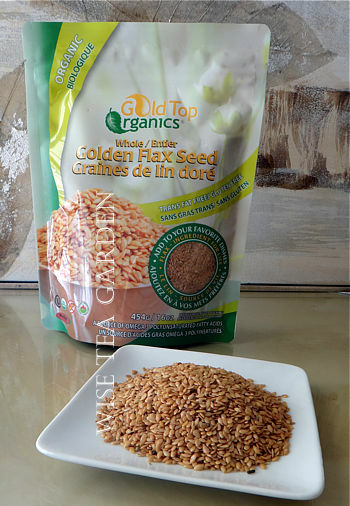 Note that the seeds of Golden Flax are much tastier than Brown ones. They have a nice nut flavour with slight fresh vegetable undertones. We would suggest to grind 1-2 tablespoons in a coffee grinder and add to any dishes. Suggested intake per day - 2 tablespoons. Ingredients: Organic Golden Flax Seed. Lignans Content: 75mg per 15g.